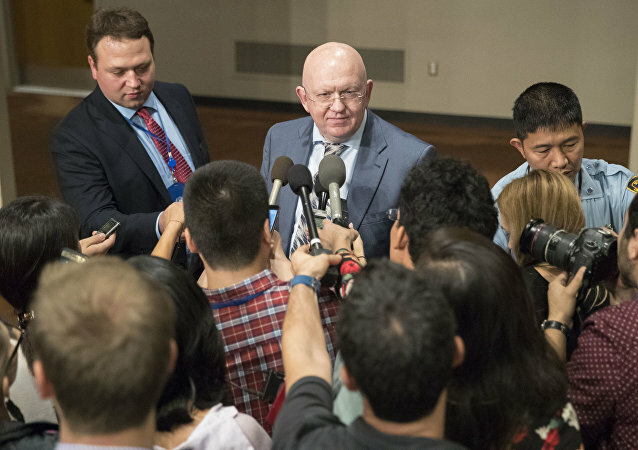 WASHINGTON (Sputnik) - The current situation in Syria is extremely dangerous, and therefore the top priority for all parties involved should be to avoid a wider war in the country, Russian Ambassador to the United Nations Vassily Nebenzia told reporters on Thursday. WASHINGTON (Sputnik) - The Nord Stream gas project does not pose any risks to maritime operations in the Baltic sea, German Navy Vice Admiral Andreas Krause and Swedish Royal Navy Rear Admiral Jens Nykvist said on Thursday. The newly declassified archival documents were released just in time for Cosmonautics Day, celebrating cosmonaut Yuri Gagarin's historic April 12, 1961 flight aboard the Vostok 1 spacecraft. Emergency services are at the scene of the accident. A Moscow City Police source told Sputnik the crash took place at around 4 pm (16:00) local time, and involved a Volvo bus and a hatchback. MOSCOW (Sputnik) – A Russian Yak-130 plane crashed in southwestern Voronezh region during a scheduled training flight, both pilots ejected themselves safely, the Russian Defense Ministry said Thursday. MOSCOW (Sputnik) - During the 2018 FIFA World Cup, foreign citizens with the FAN IDs will be allowed to travel visa-free to Russian cities, which do not host football games, Andrey Chernenko, the head of strategic projects at the Russian Ministry of Communications and Media, said on Wednesday. Sanctions against Russia’s state debt will lead to domestic investors replacing foreigners on the state obligations market, Russian Finance Minister Anton Siluanov said.